Siegfried Hecker is an American scientist who served as the Director of the Los Alamos National Laboratory from 1986 to 1997. He is currently Professor (Research) of Management Science and Engineering and Senior Fellow at the Freeman Spogli Institute for International Studies at Stanford University. In this interview, he discusses President Ronald Reagan’s negotiations with Soviet General Secretary Mikhail Gorbachev in Reykjavík, Iceland and the burgeoning scientific and nuclear collaboration that resulted from the 1986 summit. 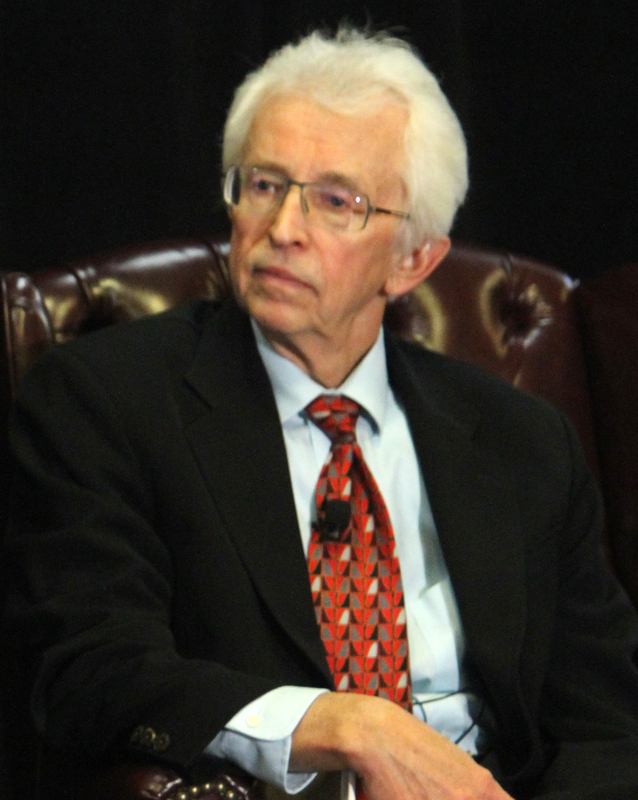 Hecker also recounts the story of how he came to be Director of the Los Alamos National Laboratory, and why he did not think he was qualified for the job. Rhodes: What you did most recently, was it relevant to the larger story that we have talked about before? Hecker: Yes, it is. It has a few interesting and different twists that would take some time to explain. You know, just for example, I actually went over on behalf of the new Ted Turner Foundation. That is that I have actually decided that I am going to do a sabbatical leave from the laboratory, but half time spread over two years, and working with this new Ted Turner Foundation, which he set up to donate his private money to help deal the kind of the residual issues from the Cold War and weapons of mass destruction. Rhodes: Is this the one Sam Nunn is running? Hecker: That is the reason why I decided to do this. Not that I have any particular love for Ted Turner, although I very much respect his business abilities since he has made it, and of course has introduced a whole new way of doing news. But it was Sam Nunn and Charles Curtis. Charles Curtis was Deputy Secretary of the Department of Energy during a good part of the time I was Director and one of the most respected guys in government. He left government, Sam Nunn left government, and they are the ones that convinced Turner that it is worthwhile to actually use private money to help to address this issue. I personally have enough frustrations with our own government and its inability, especially over the past three or four years, to take advantage of the opportunity that is there with Russia. So I’ve, for the time being, switched my allegiance. The Russian part of what I am doing right now for Ted Turner and company, that is why I was over there. Hecker: But maybe what I can do is just quickly summarize, which will jog your memory then if you come back to this. What we had discussed, you know, first of all, was, what are the risks associated with the Russian nuclear complex? As I pointed out, I kind of laid out this hierarchy of risks for accidental launches to loose nukes and loose materials to loose knowledge to exports. Two, the whole issue of the huge size of their materials inventory and the production complex, and then the last one being accidents or environmental disasters. You had asked, “How do you know that some of these things have not happened?” Indeed, in the materials part and the knowledge part, we will not know until something bad happens. One needs to just continue to work at this. We discussed a little bit sort of the difference of philosophy between the Russians and ourselves. They live with greater vulnerability than we are willing to live with. But they, of course, were fighting to stay alive essentially in this new system. How to eat and heat their houses, feed their families. So we started working with them on these issues. Tried to start essentially ten years ago when we first went over there, because that was the thing that was immediately obvious. The part I never went back to, I said initially there were two things that struck me at least. One is this one, that you could put in the area of clear and present danger because of what happened. The second one is actually the flip side of that, and that’s opportunity. Now that the Soviet Union is gone and communism collapsed, you have got this new country. But this new country has this awesome arsenal. Of course it is also, even though it is a new country, it has a history that is enormously complicated. Essentially a thousand year history where people never really had the basic freedoms and so how are they going to go now? In which direction is this country going to go? Then particularly what is going to happen to its nuclear complex and its nuclear posture? Do we have an opportunity that perhaps, by the way that we treat them, that they would actually shape their nuclear complex and posture and then eventually their country in a way that they become a friend rather than an adversary? So that was kind of the larger ambition. Obviously, that is not one where I personally can play a large role. But yet, it certainly seems worthwhile. Rhodes: You know, this echoes the concerns and the hopes that the scientists had in the very beginning of the atomic era. That somehow science itself, because of the way scientists relate to each other, might become a kind of model for international security. That was what [Niels] Bohr hoped. That was what [J. Robert] Oppenheimer hoped in 1945. Rhodes: So you are talking about the same idea again, really. Hecker: It’s interesting, actually. You know, I must confess that it was your writing that really put that thought into my own mind, because at least the way that I was brought up, science was reasonably narrowly focused. I was not at all like a Niels Bohr, who must have thought from the time that maybe he was a few years old as to how he was going to change the world. You know, science can do, and to me it really didn’t, I must say, it really did not hit me until I became Director of this laboratory. You would think that you would want to put somebody in the directorship that has that sort of vision in his head already. That was not at all the case with me. You know, I have been in a reasonably narrowly focused area of science. My own interest is materials. I had thought as broadly as wanting to make sure that we had the best materials, the department, here at the laboratory, anywhere in the world. I certainly started thinking about how material science, materials engineering and technology, can help to do things for mankind. Hecker: But not beyond this, not the Bohr and Oppenheimer sort of thinking. That then came with the job. Rhodes: Yes, well, I think it did for them too. Hecker: And it may have. And then it came for me. It came with reading The Making of the Atomic Bomb. I have often used quotes from your book or from your lectures. I found that aspect of it very, very intriguing. Hecker: First began to think about it here in the spirit of just the laboratory and kind of the new responsibilities that I had. I was smart enough, I guess, to figure out that, boy, this was my responsibility. This was 1986 when I became Director and so there was, let’s say, the first year, kind of the education of a person who really had never thought that he would lead an institution like this, and the recognition of the responsibilities. But then what you had just mentioned, this role of science, it did not really hit until the Russians. Then it was just like born instantly. I went over there. I have a favorite photograph of where I reach out to shake the hands of their Oppenheimer. His name was Yulii Khariton. Hecker: And you know. You have read about him, of course. Hecker: Did you meet him? Rhodes: No. We had a little bit of email correspondence. Hecker: Yulii Khariton was there to greet me, and the look in his eyes. He was eighty-eight at the time. He reached out his hand and it was instant. I all of a sudden realized exactly the power that you talk about. Then when we sat down to dinner that night—they had us in what they call the House of Scientists—he explained the whole Russian nuclear program, went through it all. It was amazing because the only thing that was really publicly known at the time is we had a pretty good feel that [Klaus] Fuchs gave them a lot of this stuff. I said, “Oh.” Well Yulii is—Julius for Oppenheimer and Yulii for Khariton. It is the same name. So it was during even those first moments that I felt that I had this opportunity personally. You are in this country and you have the Los Alamos National Laboratory. It is a great place. I had always considered it a great place. But I did not realize how great a place it was until I went over there. Rhodes: But then who would have a better professional assessment than they, of this laboratory? Rhodes: This laboratory was doing exactly the same work they were doing, right? Hecker: That is correct. That is exactly right. Rhodes: They saw you making breakthroughs. Hecker: Yeah. So the respect was there already, because it was respect for the institution. Additionally, as we talked to Khariton, and then as I got to know him somewhat better, I talked to him a few more times. But then especially as I got to work with his colleagues, the then lab director, his name was Vladimir Belugin. The fellow who became lab director after him, Radiy Ilkaev is the person that I dealt with now quite a bit. Ilkaev is I L K A E V and Belugin is B E L U G I N.
We built up friendships and relationships. As we look at the responsibilities we each had in our jobs, we realized the symmetry of the situation. It was just identical. They were doing their job for the same reason I was – to protect our country. So you would think, “However, they work for a guy like [Joseph] Stalin. How in the world could anybody ever work for Stalin?” We had those sorts of discussions, and it was through those discussions that you really got to appreciate their point of view. Khariton said to me personally, but [Andrei] Sakharov has also written on it quite eloquently. The essence was, they just had their country devastated by the Germans. They felt the monopoly in the hand of the United States was bad not only for their country but it was bad for the world. Hecker: After a devastating war, they really felt that they were these new types of soldiers, scientific soldiers that were going to keep their country safe and secure in the future. The Stalin part, it was more of a secondary. They worked for [Lavrentiy] Beria and he was, of course, even a greater butcher, if that’s possible. Hecker: Yet there were lots of things, by the way, that they respected. In fact, we just had a Beria discussion a week or so ago. There were certain aspects of Beria that these guys really liked. He could organize things. He could get things done. In a sense, he was a lot like [General Leslie] Groves, that he just knew how to get things together. Rhodes: That is good. I never thought of that comparison before. By the way, also an interesting sideline. This is Vladimir Belugin, who was the director when we had the first exchange of lab directors. He, of course, grew up through the Soviet systems like all of these guys did. Many of them belonged to the Young Communists and Komsomol and so forth, because that is what you did. You have to get to know them to really appreciate them personally, and I got to know Belugin quite well. He is just a terrific person, really terrific person. I have videos of him singing Russian folksong because he’s got a terrific voice. But anyway, Belugin and I are working on a paper now, which we’re getting ready for the tenth anniversary of our meeting, which will be in February. Hecker: We decided we would write a paper together, kind of the American and the Russian view, side by side, of how did we get there? You know, to be able to meet. What did we face? What did we think at the time we met each other? What did we think we would be able to accomplish? How have things gone since that time? What do we see as the prospects for the future? So Vladimir and I, we have outlined it when I was over there six weeks ago. We got together several sessions, kind of outlined things. He went on to tell me of how he considered Reagan an absolute hero. That Reagan was there and he stood up for his country. Tough, stood up, built up the defense. “I am going to build the defense, in addition to the military posture. I am going to do this because that is the right thing for the United States government.” He said Gorbachev went and he caved in. He just gave it all away. He just gave everything away. And so he considers him a traitor. It’s by far the most vivid that I have ever seen that expressed. You can go around Russia and just essentially nobody has any use for Gorbachev. Of course, the interesting thing, I consider him the key person who changed the world. Hecker: The Russians just have no use for Gorbachev whatsoever. It was this idea, and we will get it better when Belugin writes things down, but it was the idea that Reagan went and protected his country and stood up for his country, and that Gorbachev went and gave it away. That they cannot forgive him for. That is the way they viewed it. Apparently, from the way Belugin said it, there were some other things that he said have never been made public as to what Gorbachev was ready and willing to do. Apparently, these are the things that really bothered him. Rhodes: You mean in the nuclear sphere? Hecker: Oh yeah, yeah. Right. Particularly. Hecker: Because that was Belugin’s principal concern. At any rate, that was fascinating. Rhodes: Where is the meeting going to be, the anniversary, the tenth anniversary meeting? Rhodes: Where is the tenth anniversary meeting in February? Hecker: Oh no, we have no meeting. We’re just doing this as a publication. Rhodes: Oh, I see. Okay. Hecker: In fact, now that you mention it, we may try to get together informally. It would be appropriate in either place, actually, because they came here first. Once we got permission to do this, they agreed to a director’s exchange. They came here first to the United States. Rhodes: Oh, I did not realize that. Hecker: They came here first. Hecker: So they were here in mid-February of 1992 and visited Los Alamos and Livermore. They being the directors of their two laboratories, Arzamas-16 and Chelyabinsk-70. And then we turned almost right around within two weeks and went over there. It was John Nuckolls who was Director of Lawrence Livermore [National Laboratory] and myself. We each had a few folks with us. We had two on each – I had two Los Alamos people, John Nuckolls had two Livermore people. It was six of us who went over there. Rhodes: Was Steve Younger with you at that point? Hecker: We brought Steve in then after this lab directors’ meeting. We had agreed that it would be very beneficial for us to work together. First of all, in the spirit of tackling some of the immediate issues but then also, the Russians actually had these broader things in mind that you mentioned before, the Niels Bohr type of vision of the world. By the way, a couple of Russians have essentially told me that. I wrote to Belugin and he wrote me just the dearest letter back. It captures some of the Bohr spirit. First of all, he said something very cute. He said, “Having read what you wrote and having thought about this myself, I have also decided to retire.” And in his case, really retire. He wanted to get it through, get the whole system through the fiftieth anniversary before then, which he did. He went on and he philosophized about what these meetings have meant to him and to the world. Ilkaev, the current director, is particularly wise and philosophical person and he has often talked about what this really means and why we work together for the betterment of mankind. Khariton in his – I’ve written a paper and I had a chance to give a lecture at a conference that was in honor of what would have been his ninety-fifth birthday. He died at the age of ninety-two. I gave a paper in Sarov, in Arzamas-16, called “An American Tribute to Yulii Khariton.” At the end, and I can get you a copy of that paper, at the end, I used a quote that I took from a paper he wrote. He was invited to come here and give the J. Robert Oppenheimer Lecture and he could not come because of his health had failed, so he wrote a paper. Rhodes: You have that too, right? You have that paper? Hecker: I have that paper. And again, the last quote essentially is one which again, has this deep philosophical meaning about the responsibility we face as scientists having been given this responsibility, created something that is so horrific. “Now let’s pray to God that we use this wisely.” Very, very touching. It has been very interesting to interface with them, to get their perspective of this broader thing. Much as we were commenting at breakfast about some of the Russian writers of the last, nineteenth century, these guys have a lot of that philosophy in them. Hecker: So Lab-to-Lab scientific collaboration, and I asked Steve to take that on and he did. He is the guy who really set the tone for working together with the Russians side by side. The Russians like to call it “shoulder to shoulder.” They do not say “side by side,” for some reason. Shoulder to shoulder towards common goals, in this particular case, research goals. But Steve really set the tone as to how we work with them. He did it exceptionally well, because it took two things. It took, one, the spirit of side by side as equals, because the one thing that it was clear the Russians were most concerned about, even though their country had now disintegrated. They had, one could say, lost the Cold War, so to speak, if anybody lost it. They did not want to be treated as the vanquished or as being inferior in any way, shape or form. One had to treat them as partners and Steve knew just how to do that. On the other hand, though, it had a peculiar twist, which made life much more difficult. That is, we were paying them in these collaborations because they were badly in need of money. Their government had almost totally cut them off, just barely paying some very, very small salaries sometimes, even many times not paying them for months at a time. They could almost do no research of any sort, because they had no money. Particularly if they needed any equipment, anything that was Western, they had no dollars. They had no way to buy anything. We were in this peculiar situation. On one hand, being partners and trying to be equal, but on the other hand, we were also customers, so to speak, because we were paying for the research. Rhodes: Oh, I see. So you were essentially contracting with them to do things? Hecker: That is exactly what we did. We wrote contracts that they would do research, which would be of interest to us. It was also of interest to them, but it was of interest to us. Steve did just the right combination of things – how to be a good customer and teach them how to be good at supplying what the customer wants, and at the same time treating them as a real equal. He set this program off in terms of the scientific collaboration on a very, very good path. Those particular areas that we worked on are still alive and doing well today. One area is one of pulsed power. Some ideas that Sakharov developed some years ago where you can use explosives, for example, to compress magnetic fields to generate extremely high magnetic fields or also, in some cases, to maybe contain a plasma for a fusion. Those were some ideas that he developed for what is called magnetized target fusion. You take a target and then you use that in combination with either—some use generator banks or explosives in order to get a compressed magnetic field. So Steve was really instrumental in doing that. Rhodes: Maybe we should go back chronologically. I am particularly intrigued at the beginning by your talking about the Reykjavik experience for you here. Was there no anticipation—I guess there was not—that Reagan was going to propose that he and Gorbachev were going to discuss eliminating all nuclear weapons? Hecker: Okay. You asked about Reykjavik and warning. As I was saying, I was very much a novice laboratory director, having come into office in January of ’86. Really having, I would say almost as close to zero experience on the international scene as you can get. That just was not in my background. I came up through the scientific end of things. Rhodes: But was that a job requirement here at the lab? Hecker: No, no, no. Not for a scientist, but for a lab director. Rhodes: Yeah, oh, well, inevitable. Hecker: I never thought it was a job requirement. In fact, just for an interesting aside—I had never ever even dreamt of being Director of Los Alamos National Laboratory. That was never in the cards, never in my plans whatsoever. Never even crossed my mind once. To lead the materials activity here, yes. Hecker: And I did, actually. Hecker: I got this call one time, actually when the previous director, Don [Donald] Kerr resigned. I had done a number of things, headed some task forces and did some things at the laboratory where I had some more visibility. I led a very large division that turns out the materials and at that time, we had nuclear materials and other materials together. It was like 700 people, so it was a huge division. I personally had worked in the materials part of the nuclear weapons program with plutonium for a bunch of reasons. One most important being that it is by far the most fascinating element in the whole wide world. Hecker: At any rate, I had done those things. Don Kerr decided to move on, and the University [of California at Berkeley] had formed a search team. Now, I do not know whether you want to go into this. Rhodes: I figure you are one of the central threads in this book I’m going to write. Hecker: Well, you might get a chance to take that out yet. Rhodes: Your experiences and your story. Hecker: In case we get too far. But it gives you some explanation as to why the bottom line answer to your question was, I had no idea what they were going to do until I got here. Rhodes: But I am not sure anyone did. Richard Perle talks about everybody being totally surprised. Hecker: Okay. So just to tell you the story of the directorship and how it happened. So Don Kerr announced that he was leaving. The University had put together a search team, and it was only in the University fashion that they could ever come up with a guy like me for director. It could never happen in the corporate boardroom. So the way universities, you know how they do these searches, right? They go out and they kind of comb everything. Bill Frazer, who was Academic Vice President of the University, was doing the principal work for the search team. The search team was chaired by David Gardner, the President, but Frazer was the guy that went around. Especially he came out here. Somebody had told him he should come and talk to me because I had some ideas as to what their next director should really be like. Indeed, I had given that a lot of thought because by that time, since I was leading a very large division, although in terms of the hierarchy of the laboratory, I was not in the highest echelon, let’s say, of management, kind of the next level down. Yet it was important to me for two reasons. One is, I really cared about the laboratory and then second, once you get to that level, if you get somebody in whom you really can’t stand, then you have to leave. Hecker: Neither Nina [Hecker] nor I wanted to leave. We thought this was a great place. I could do all the things I want to do here. It is really important to get the right director. I put together a very systematic view of what the director’s qualifications should be. I got together with Bill Frazer and we had a very nice discussion. In fact, interestingly, at that time, I was not the leader of this division anymore. I led the 700 people division and I decided, I said, “This is really not something I want to do,” although I was enjoying it. I said, “I enjoy my research a lot more.” So I actually went and a few months before all of this happened, the director’s search, I changed from being Division Leader of Material Science and Technology, 700 people, to heading up the Center for Materials Research, which was like a center at a university. It had half a dozen to a dozen people. I was going to be able to do half-time research, lead the center and look at more interdisciplinary aspects of materials in the laboratory. I had actually helped to found the center a few years ago. We needed a director and I said, “Geez, I’d rather do this than worry about leading 700 people and all the administrative stuff.” So I actually took a step back from a large administrative post to more of a scientific leadership post. That was another reason why I would have never, ever thought that I would be director. I said, “Bill, you were just out here and I gave you the qualifications, and I don’t meet my own qualifications.” That is what I told him. I actually said, “Look, Bill. Let me think about this, because it just does not make any sense to me that the laboratory can’t do better. Get somebody with better qualifications, somebody who has been prepped to take this sort of job.” Again, my part was more the scientific world, the scientific professional societies. I had a lot of industrial contacts in the scientific world. I had some technology contact into the military because I had actually worked with the Air Force on some technology systems, but never these bigger pictures, no contact in Congress. I did not know anybody in Congress at all. It just did not make any sense to me. My first inclination was almost in a joking fashion – my God, I’m not going to work for a laboratory who is willing to have me as its director. I was actually going to go into the interview being very skeptical as to why these guys would possibly want me as director. Hecker: For whatever reasons, if they want me to be director, then I should go and take it seriously. So I did. I said, “What do you mean?” I had on this purple shirt, and a grey tie, and a grey sports coat. I forget what color the slacks were. I had made sure I had checked it out with Nina, and she thought that was just fine. Hecker: John Herrington, who used to run the White House personnel office for Reagan, he was a Walnut Creek lawyer, had been made Secretary of Energy. A very interesting guy by the name of Joe [Joseph] Salgado was his Undersecretary. He was kind of the Chief Operating Officer of the place. I went in with him first in an interview. He was an ex-Oakland cop, Oakland D.A. He spoke very bluntly. Hecker: But we hit it off immediately, and so then the DOE scene was really no problem. Congress was also reasonably straightforward. The military took a lot longer and the policy community just took a lot longer. I set up a Center for National Security Studies within the laboratory within the first six months, tried to bring people in the policy arena here to the laboratory. Bring them through either for short stays or in some cases, we had some post-docs. Rhodes: Just for your education? Rhodes: Was this for your education? Hecker: Oh no, no, for the laboratory, but it served a huge role in my personal education. Hecker: Both in terms that I learned things, but I learned people. For example, in the military, you not only have to know all the current generals and admirals, but you have to know all the retired ones because they all continue to have a significant influence on one advisory panel or the other. Hecker: And so I needed to build a network of people that I would know and that would advise me. But the principal reason for the center was kind of two sides, the flip side of the coin. That is, that we needed to understand the policy arena better because it influences our technical directions. The flip side was that the technical directions and the science should help to influence the policy. Hecker: So we set that up. We had one of our scientists who had actually come from Livermore that managed our Nuclear Weapons Design Division, Bob Selden, who had many of these contacts that I did not have. I asked him to head it up. Selden, S E L D E N. It was just very good. He had the contacts into the military community, the policy community. We brought a few people here who were non-technical PhDs in policy. So that began my education and also put the laboratory in a position to better think through its future. But then came Reykjavik. We knew, of course, that Reagan was going to Reykjavik. There was going to be a summit. There were going to be discussions about nuclear arms, about the nuclear arsenals all around. But I had no idea then what they were actually going to propose, this elimination of all nuclear weapons. We were all flabbergasted at the time. But as you say, maybe few people really did. Rhodes: As I understand it, Perle and his group worked all night to try and make sure that didn’t happen. It didn’t make any sense to them at all. Hecker: Those two guys got together. Hecker: But then you know, I mean, we also realized right away that it’s not possible. You just cannot get rid of all nuclear weapons. Hecker: In fact, that it is not only not possible, but that it would not be wise. Reykjavik was really the sea change for us, immense sea change because when I came in, it was still “evil empire,” still the enormous buildup of all military things, including the SDI. Although from a budgetary standpoint, it was interesting that we had already seen the slope change there, and that was Gramm-Rudman-Hollings’ time, if you remember. That was the first amendment to go in and cut the budget. That was 1986 and we already had the 1986 budget. They went ahead and passed a supplement to that budget, like 1986A or something to that effect where I think they took back five percent of the budget, the federal budget across the board. We were kind of immediately hit with some budgetary considerations. Copyright 2010 Richard Rhodes. This transcript may not be quoted, reproduced, or redistributed in whole or in part by any means except with the written permission of Richard Rhodes. Exclusive rights granted to Atomic Heritage Foundation.